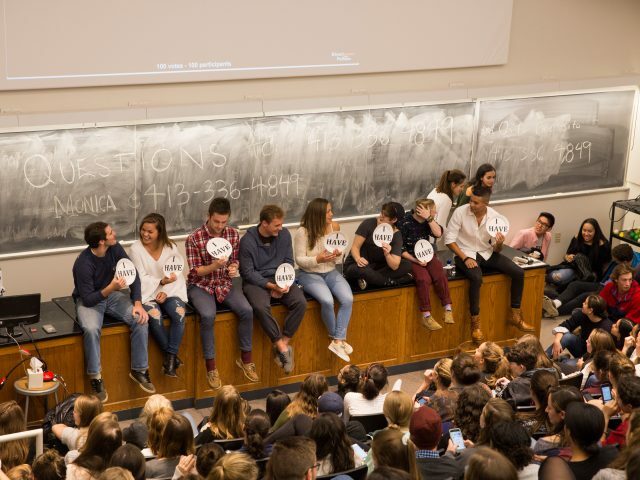 Last week, Bowdoin Student Government (BSG) kicked off its annual No Hate November programming, a month dedicated to eliminating bias and increasing discussion around identity on campus. The event series has been held for five years, but this year the focus has changed to promote student voices on campus. Students will also be able to pick from an especially diverse spread of events. The opportunities to engage range from a panel discussing the experience of Muslim students to a performance by Gina Yashere, a British-Nigerian comedian who is the current British correspondent on Comedy Central’s “The Daily Show with Trevor Noah.” The keynote speaker for this year’s programming will be Bowdoin alumnus Deray McKesson ’07, a prominent leader of the Black Lives Matter movement and member of the LGBTQ community. 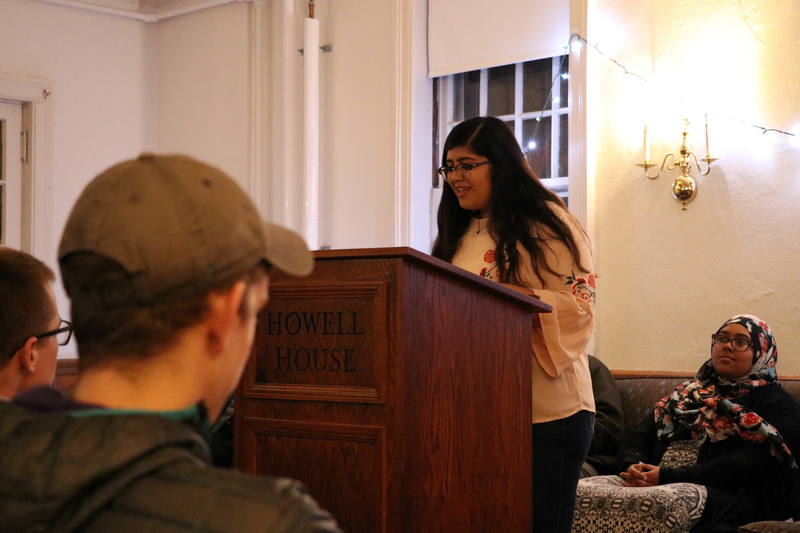 Anam Shah ’21 spoke in Howell House on Thursday night at “Stories of the Crescent: The Lives of Muslim Students at Bowdoin.” Students shared their experiences of being Muslim on Bowdoin’s campus. This year, BSG tried to be as inclusive as possible toward different identities and groups on campus in its programming. “I think we try to hit as many topics as we can while still remaining authentic and genuine,” BSG Vice President for Academic Affairs Mohamed Nur ’19 said. By showcasing a variety of communities, BSG believes students can learn to be more cognizant of others. “All of these issues are affecting our students as they navigate their way through their Bowdoin experience and it’s important to know about those in order to make actions in support of each other. We can’t let our ignorance get the best of us because we are all part of each other’s experience,” said Salim Salim ’20, vice president for student affairs. Unlike some previous years, Bowdoin didn’t endure any acts of bias at Halloween this year, but Salim warned that there is still work to do. The memories of discriminatory events are still fresh in the minds of many Bowdoin students. These events have included racial slurs written on whiteboards, a “gangster” party held by the sailing team in 2015, the lacrosse team’s “Cracksgiving” party and the 2016 “tequila” party. Such events are not restricted to campus. Part of the reasoning for the first No Hate November in 2013 was an altercation between a Brunswick community member and a gay student. Since then, other students, such as Salim, have also experienced biases throughout the Brunswick community. Last year, Salim was participating in a local elementary school visit for his education class when, as he was introducing himself to the teacher he was working with, he experienced an act of prejudice. “He asked if I speak Muslim and I was shocked by that response. I thought he, as an educator, would be more aware of the difference between a religion that is practiced by over 1.2 billion people and a language,” Salim said. Salim hopes that by sharing their experiences during No Hate November, students can help inform the community as well. “The [Brunswick] students who are attending these events are a part of ‘Bear Buddies’ and a part of other programs that are reaching out to the community. Through those ways I can imagine Bowdoin students educating the community,” Salim said. Even though the events this month may take students out of their comfort zone, BSG urges students to attend. “I wouldn’t say the events we have this month are provocative, but they are difficult and I think they are supposed to be difficult. If it were easy we wouldn’t have a need for No Hate November,” Nur said. Nur is excited about the opportunity to expand the media used to facilitate discussion. “This was BSG’s way to begin a dialogue on campus around diversity and inclusion and really just showcase the tremendous amount of diversity we have on campus. The goal of No Hate November is to address the biases we have as a campus through lectures, panels, conversations, artists, comedians and spoken words artists,” Nur said. Nur also believes that events like those planned for this month are representative of the dialogue the College wants to promote. “Clayton Rose wants us to be intellectually fearless and this is an opportunity to actually practice that,” Nur said.